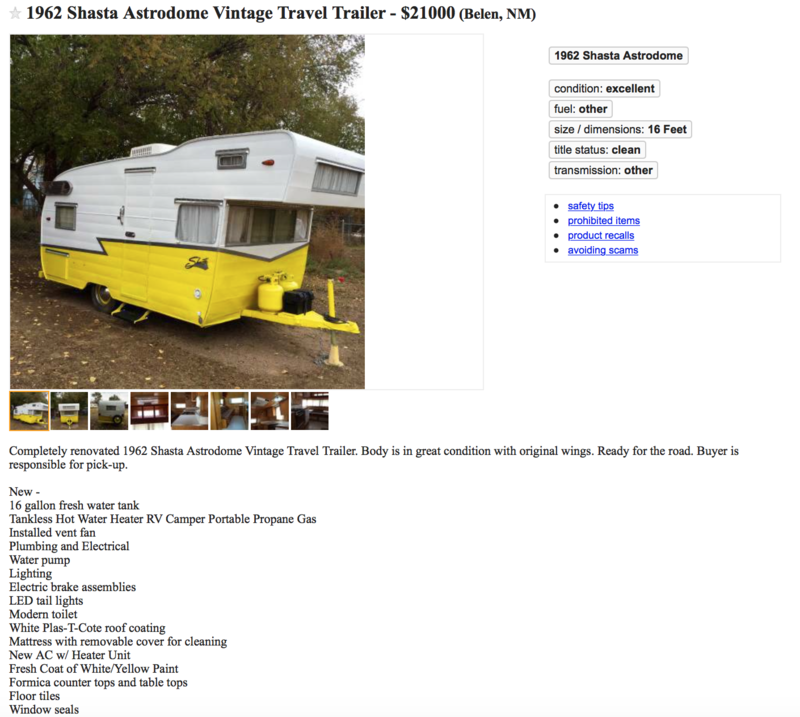 You might mistake the Shasta Astrodome for a canned ham trailer, but you'd be wrong. 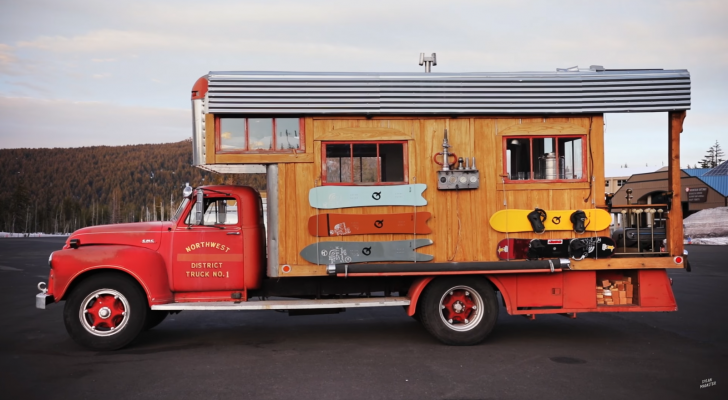 In reviewing vintage trailers, I find that so many of them are almost exactly alike. 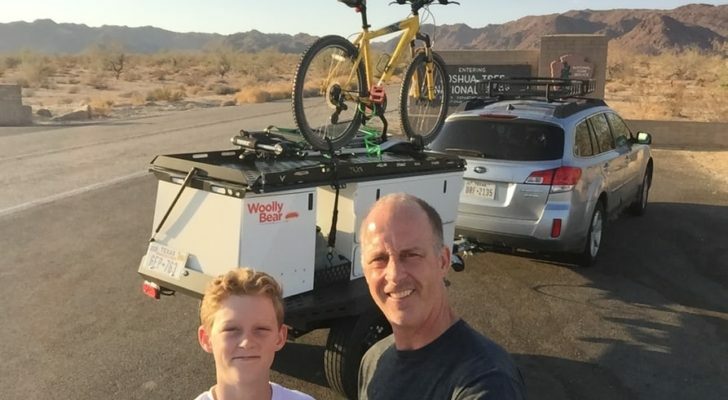 It’s as if everyone who ever thought of building travel trailers for a living went and toured the other guy’s factory and used a microfiche camera to photograph their plans and build the same box on wheels with all of the same features. Not so much with the Shasta. While we see the same look and feel, there are a few key differences in this 1962 Astrodome. The unique profile of the Astrodome extends the living space over the tongue. America was in the height of the space race with Russia. It was post Korean war, pre Viet Nam and we were looking for anything that could point us to the future. The early sixties were one of those rare moments when we experienced peace and leisure like rarely in our history. This trailer is the quintessential product of that time. Front view, showing window in upper berth. From the outside, the design is already a departure from the “canned ham” of the decade before, looking half trailer, half truck-back camper. The designers make use of some wasted air above the tongue to cantilever a full sized bunk out over the tongue of the trailer. Having never towed one, I suspect this makes the machine a bit tongue heavy, but inside the difference is huge. This front-to-rear-view shows just how much space there is inside. 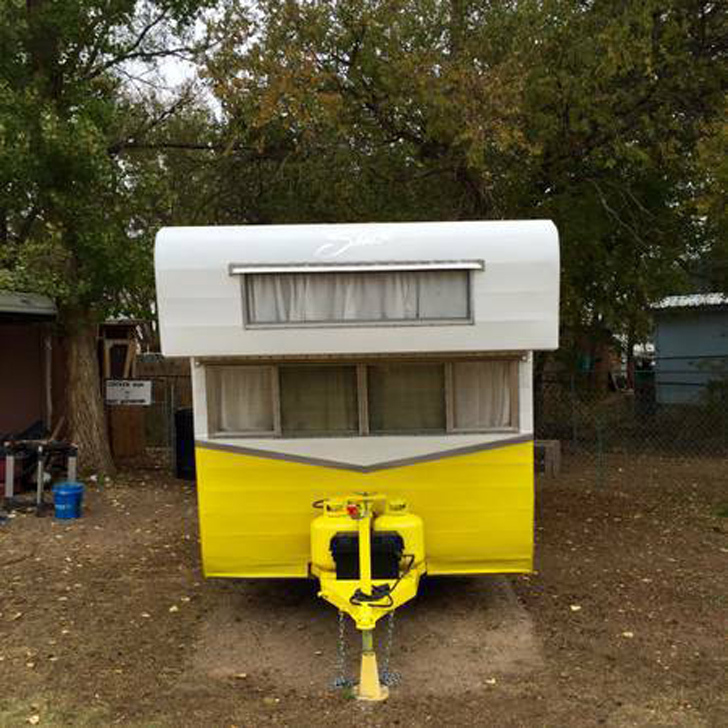 For a sixteen foot trailer of this vintage, the first thing you notice is the amount of open space the Astrodome has. 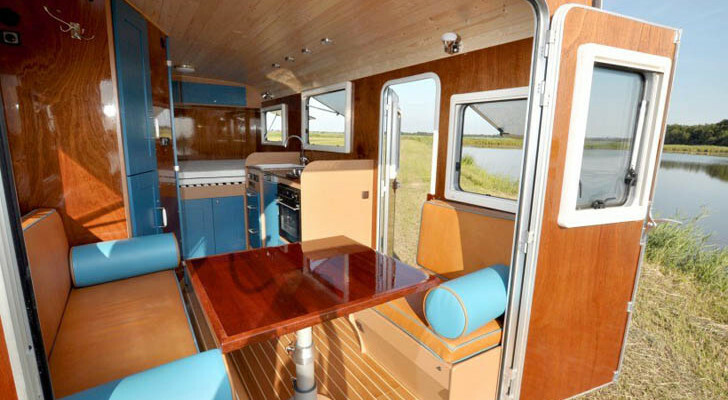 Down the center, a clear aisle about three feet wide gives enough room for two adults to shift past each other without becoming too intimate, and the added length leaves room for a convertible sofa, providing a sitting area beyond the dinette. 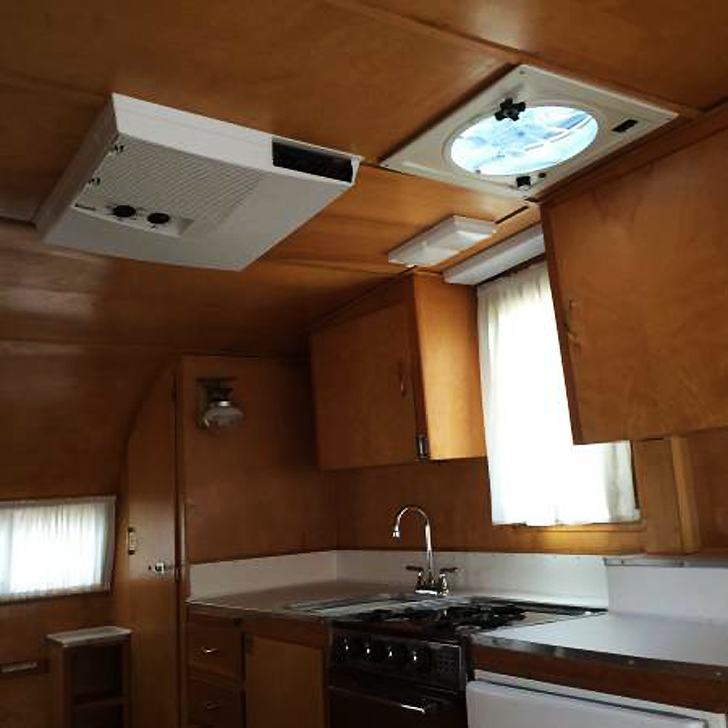 While it’s crowded to be sure, the Shasta also has a private water closet, which this seller ensures has been outfitted with a modern RV toilet. 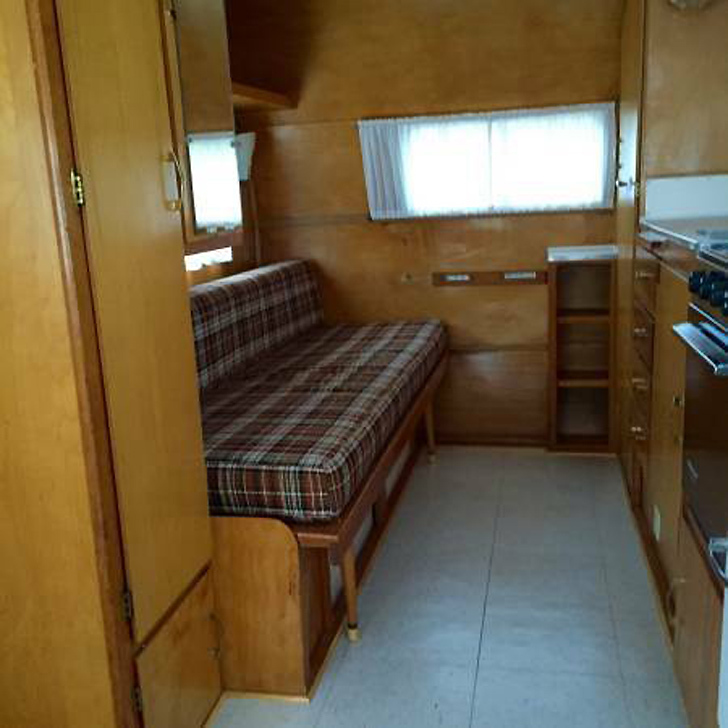 The split dinette makes for the best use of limited space. 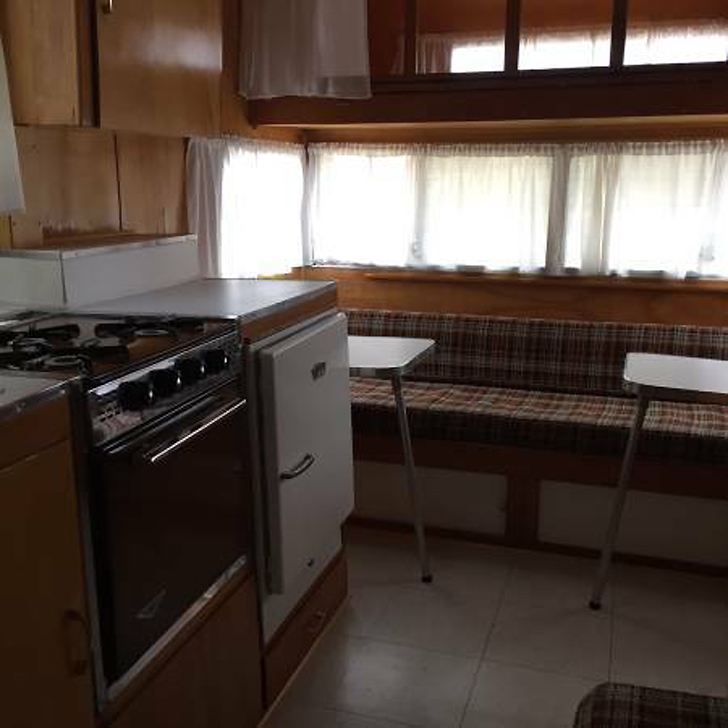 The dinette is also different. Rather than two facing benches that take up most of one side of the trailer, the bench runs full width across the trailer, with a small table at each side. It looks like it would comfortably seat four adults and with added folding seats, could easily seat six for dinner. 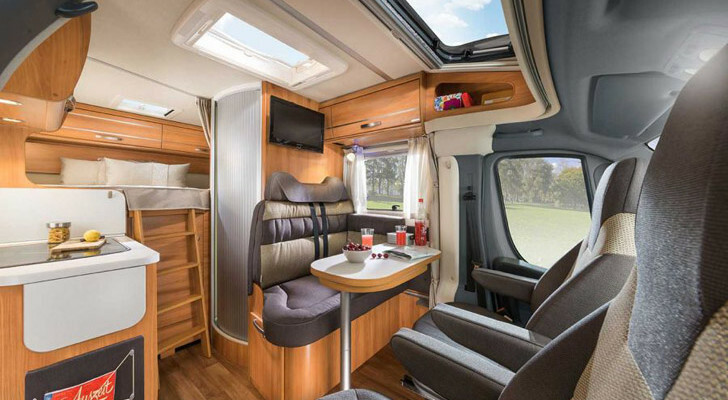 The kitchen sports what look like the original appliances, which have been rewired and plumbed – a must with vehicles of this age. Restored vintage plywood paneling and a view of the toilet closet at the end of the counter. Above the dinette is the one oddity I am not so sure about, the upper berth. 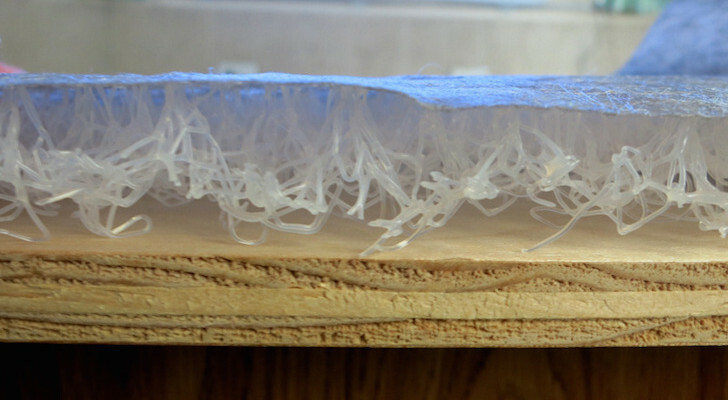 Along the front edge, there is a wooden frame that acts as a safety feature when folded up, although it could also serve to pin you in your bed in case of an emergency that required a quick exit. 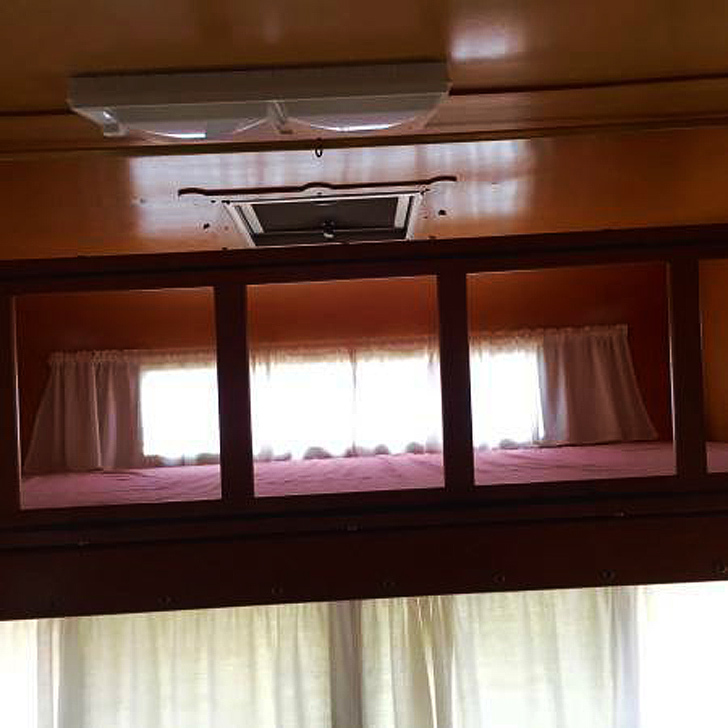 When folded down, this serves as the ladder, and the overhead room in this compartment looks small and would not be advisable for anyone that needs room to spread out while sleeping. Here is the upper berth ladder folded up, note the newer light fixture. 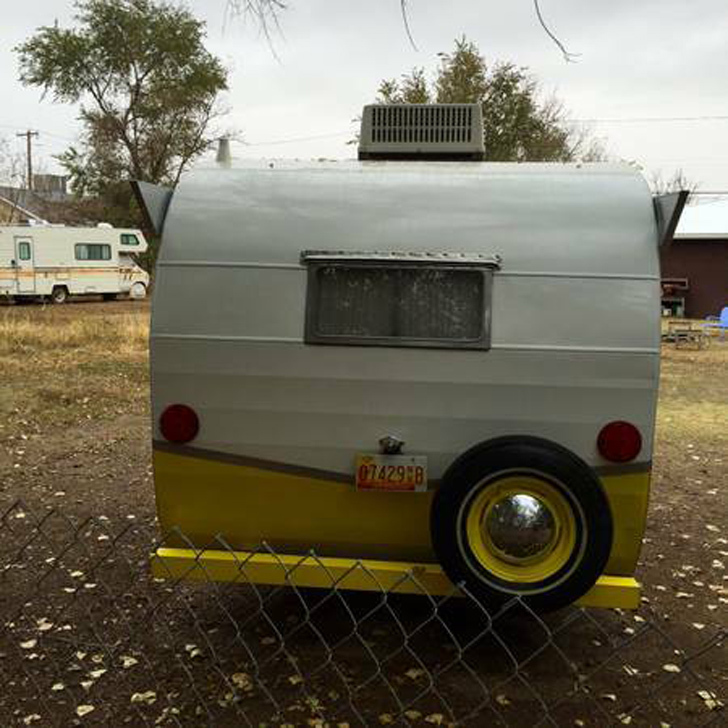 If it’s still for sale, the price tag – at nearly $20,000 – is a bit steep for a trailer of this vintage. 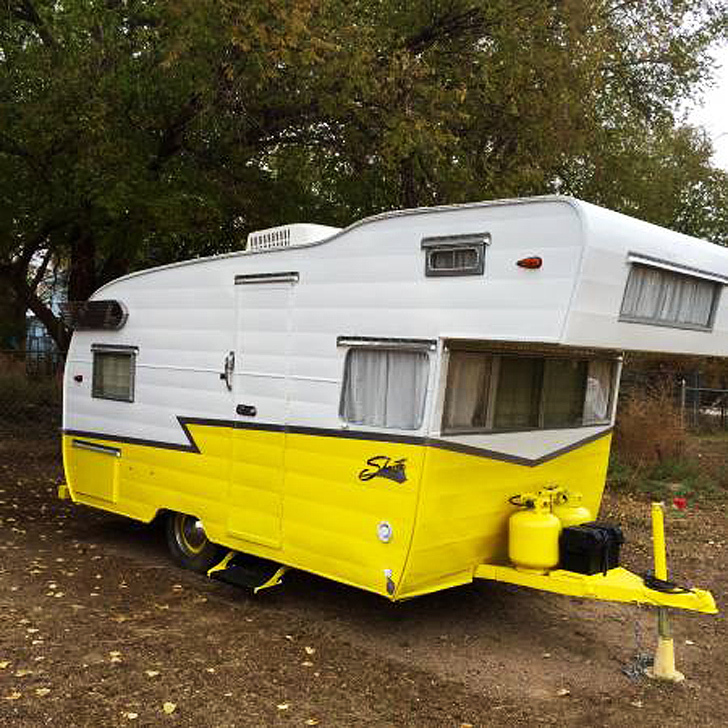 But with the added room and list of repairs and upgrades, this Astrodome might be a bargain for the right lover of vintage trailers. From the rear, the Astrodome has classic “canned ham” lines. Link to the original ad, and a filed copy in case the link doesn’t work.